This week’s posts will be a bit more tech focused, today it is attribution modelling and on Thursday it will be about cross device targeting. In this post I will talk about attribution modelling, best practice and the main models. Before we kick off lets talk about conversions. When someone visits your site and buys something or completes another important action it is called a conversion. Before a consumer converts he or she can go through multiple digital channels such as paid and organic search, referral sites, affiliates, social media or newsletters. An attribution model shows how these previous interactions contributed to your sales. Why bother with attribution modelling? The aim of attribution modelling is to give holistic and accurate information about the business return a channel or campaign is delivering so you can optimise it or in other words adjust what you are doing and with the same budget to deliver more value to your business and customers. As a prerequisite to analysing the data and creating an attribution model we need to first implement the right technology to start gathering information about where the different touch points (channels or campaigns) appear in the customer journeys. There are several ways to do this, the most common is to implement tracking tags across all of your digital activities. These tags allow individual user journeys to be tracked and analysed so you can see exactly how users behave when they are exposed to different marketing activities. This is not violating the users’ privacy as it can be done anonymously. Which are the most common models? This is everyone’s first model and the default in Google Analytics and DCM (DoubleClick Bid Manager). It assigns 100% credit to the last touch point before a conversion. It is popular, because it is simple; but because it is simple it is also one of the most inaccurate. This is the opposite of the Last Click, it attributes 100% credit to the first touch point instead. The problem is similar as for Last Click. This model gives equal credit to each touch point as it sees every step as equally responsible for the conversion. For example, in a customer journey where the customer had five interactions with your brand each interaction will be credited with 20% of the revenue from that customer. 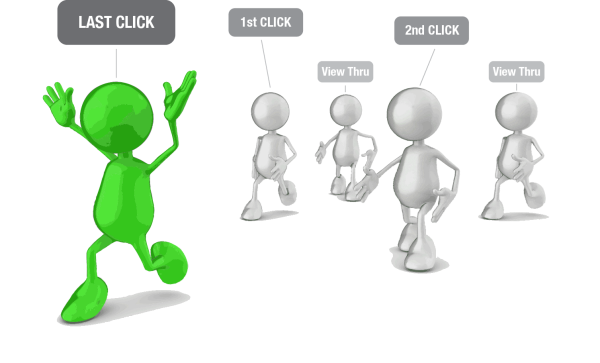 This model combines the aspects of the above three models: First Click, Last Click and Linear. Essentially it states that the first and last touch points are worth x% each and all the other touch points in between have the remaining % divided up evenly among them. In this model the principle is that the closer in time a touch point is to a conversion, the more influence that touch point had on the customer decision. This is one of the more advanced models, however this doesn’t mean that it is the best or the one that everyone should use. The above models give a good starting point on the path toward identifying the best attribution model for the brand; to evolve the model you can look at customised modelling that the data analytics experts can offer.